Iodine contributes to the normal production of thyroid hormones and normal thyroid function. Molybdenum contributes to normal sulphur amino acid metabolism. Selenium contributes to the maintenance of normal nails. Selenium contributes to the normal thyroid function. Vitamin A contributes to normal iron metabolism. Vitamin A contributes to the normal function of the immune system. Vitamin B12 contributes to normal energy-yielding metabolism. Vitamin B12 contributes to normal homocysteine metabolism. Vitamin B12 contributes to normal red blood cell formation. Vitamin B12 contributes to the normal function of the immune system. Vitamin B6 contributes to normal cysteine synthesis. Vitamin B6 contributes to normal functioning of the nervous system. Vitamin B6 contributes to normal protein and glycogen metabolism. Vitamin B6 contributes to normal psychological function. Vitamin B6 contributes to normal red blood cell formation. Vitamin B6 contributes to the normal function of the immune system. Vitamin B6 contributes to the reduction of tiredness and fatigue. Vitamin C contributes to normal collagen formation for the normal function of blood vessels. Biofood multivitamin for women with 25 nutrients and 17 organic herbs for energy, women's health issues, the immune system, digestion, metabolism and gastrointestinal issues (stomach). Nature doesn't make it any better than this! Multivitamins in nutrient concetrate. Forget other synthetic multivitamins, because the vitamins, minerals and trace elements contained in MultiVita-HER™ come in a nutrient concentrate. The bioavailability of this product is similar to the vitamins you get from your natural diet. Contents: 157g = 120 tablets each containing 1,310mg. Bioavailability is an indication used to describe the effectiveness of substances, e.g., vitamins, and shows how fast and in what quantities a substance is absorbed and can be used by the body. The higher the bioavailability, the more effectively the substance is absorbed and used by the body and the more effective the substance's impact on the body is. Essential nutrients like vitamins, minerals and trace elements cannot be found in isolated form in the food we eat but are bound up in fats, carbohydrates and protein. These co-factors are important for the body so that it can absorb and transport the essential nutrients. Synthetic vitamins, such as isolated vitamins from natural sources, do not contain these nutritional elements. That is why they depend on the availability of these nutritional elements in our body to transport them. In most cases, however, these nutritional elements are not available and the isolated vitamins cannot be absorbed but are, instead, flushed out of the system, limiting their effectiveness. Isolated vitamins and minerals are often prescribed in high doses to counteract this problem. Even such high doses, however, do not mean they will be absorbed effectively. The logical response to the absorption problem was researched in order to develop essential nutrients that are "integrated in nutritional concentrates"?in accordance with the idea of "vitamins in natural foodstuffs." The results can be seen in the excellent nutritional supplements by EnergyBalance. What is special about biofood vitamins and minerals? Biofood nutritional supplements are produced to reflect what we find in nature. However, the biofood nutrient complex is considerably richer in vitamins and minerals than the original foodstuff. These concentrated essential nutrients are produced according to the latest scientific findings and highest medical specifications - and the body is able to use them just like it would natural wholefoods. Biofood nutrients are renaturalized vitamins that have been integrated into a foodstuff matrix without water or fiber using a patented method. They are combined with the fruit and vegetable concentrates in which they are already contained, e.g., beta-carotene in carrot juice, vitamin C in citrus pulp and biotin in corn extract. and don't actually have any nutritional value. Although dried algae, yeast, herbs, fruit and vegetable extracts are foodstuffs whose nutrients can be absorbed, their vitamin and mineral content is too low to give your body what it needs. MultiVita-HER™ is tailored to your body just like perfectly-balanced wholefoods that have been concentrated and pressed into a few tablets. MultiVita-HER™ contains all the vitamins and minerals and the amounts match the nutrient content structure of grain, vegetables, legumes and fresh fruits (see table below). Because MultiVita-HER™ is structured just like wholefood nutrients, it can be safely and effectively absorbed by your body. 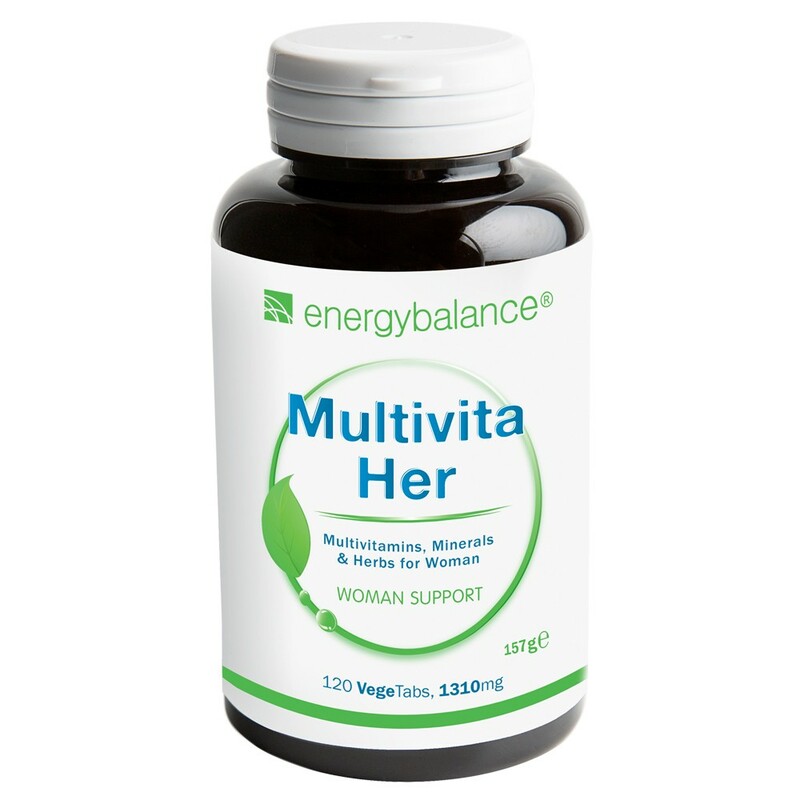 MultiVita-HER™ is rich in vitamins, minerals and also contains 40% protein, 37% carbohydrate complex and bioflavonoid. Each of the vitamins and minerals in MultiVita-HER™ is contained in a foodstuff concentrate consisting of proteins, carbohydrates, fats and bioflavonoids - and guarantees excellent absorption, retention and processing by your body. The product has been tested by independent scientists and leading universities in more than 60 scientific studies. Why do we use slow processes to produce our tablets? We use a slow, involved process to press MultiVita-HER™ into tablets This process guarantees that all of the substances we want in the tablets are included. That's why the body can more effectively absorb and use the MultiVita-HER™ vitamins and minerals than it can isolated products. Take 1 tablet 2 times daily with liquids or food. Do not chew. Keep cool and away from sunlight. Keep out of reach of children. Do not exceed the recommended daily dose. Nutritional supplements are not a substitute for a balanced diet. A balanced diet and a healthy lifestyle are important. Ingredients: Organic milled soy, saccharomyces cerevisiae (organic yeast: active and inactive), organic maltodextrin, organic gum acacia, organic orange and lemon peel - natural sources of bioflavonoids, organic carrot extract, organic alfalfa extract, lactobacilli: L. acidophilus, L. bifidus, L. rhamnosus and enzymes (deactivated), silica, lac resin and carnauba wax.